The APC caucus in the Senate has distanced itself from the suit the Senate filed at the Supreme Court, seeking the interpretation of the suspension of the Chief Justice of Nigeria, Justice Walter Onnoghen. Senate Leader Ahmed Lawan revealed the position of the APC Senators in a statement on Monday evening, not long after the Senate said it had approached the Supreme Court over the matter. 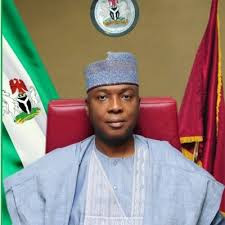 According to a statement by Yusuph Olaniyonu, the Special Adviser to the Senate President on Media and Publicity, the Senate wants the Supreme Court to determine whether President Muhammadu Buhari acted within the provision of the constitution in his suspension of the CJN. “The Senate never met to take such resolution and at no time mandated anyone to approach the Supreme Court on this matter on its behalf. Consequently, the Senate APC caucus dissociates itself from the said request for the legal interpretation of the suspension. ”“It has come to the notice of the Senate APC caucus that the Senate has approached the Supreme Court for the interpretation of the suspension of Justice Walter Onnoghen by the President and Commander in Chief of the Armed Forces.